It all began With the Jolly Corks. Starting as a group of actors and entertainers bent on having fun AND avoiding a New York Excise tax in 1867 (Sundays were the 'dry' day), this convivial group called themselves the Jolly Corks (for a clever trick with corks they performed on the uninitiated to win rounds of drinks). That same year as membership grew, some members saw the vision to become more helpful in the community. Alas, two feuding factions split the group over different philosophies. Fortunately, the latter faction moved forward with their new ideals and in February of 1868, the Benevolent and Protective Order of Elks was chartered and, with a great new spirit and direction, began to help veterans, scouts, scholarships and more wherever Charity, Justice and Brotherly Love were needed! Our lodge, the sixth in the nation, was originally chartered in 1877 and was located in the downtown area of Sacramento. River trade probably brought with it some unsavory characters and approximately two years after the lodge opened, the charter was rescinded due to illegal and immoral activity. San Francisco was then awarded the use of our No.6 designation in addition to the two lodges they were already operating (Lodge #3 & Lodge #12). Two years later, their charter was rescinded. 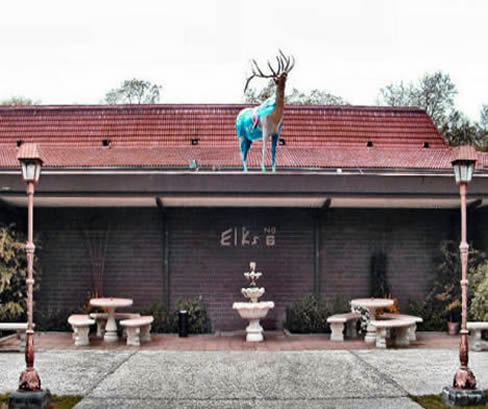 Members of Elks Lodge #6, which regained its original charter number in 1908, met in various places during the lodge's early years, including the site of its first gathering as Lodge No. 328 at Foresters' Hall at 716 I St. and at the Ruhstaller building, which still stands at 902 J St. across from Cesar Chavez Plaza. Without a doubt, the most impressive contribution to Sacramento's architectural beauty was the new Elks Temple at Eleventh and J Streets. This magnificent structure had been erected and furnished at a cost of approximately $1,500,000. The first definite step toward the building of the new Temple was taken in 1922 and completed in 1926. Not only was the exterior lines and colorings beautiful and harmonious, but the interior of the building was fully in keeping with what one might expect in such an attractive structure. 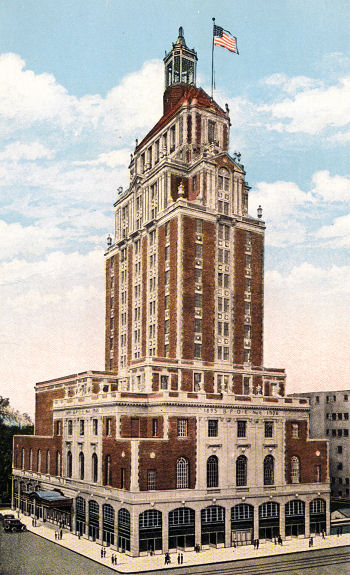 The Elks Lodge was justly proud of its Temple and of the work it had done to bring about the consummation of a task that seemed herculean when first undertaken but which had been completed wholly by its own efforts and within its own Lodge. It truly was a Titan effort to build and equip this magnificent Temple. Credit for the achievement must be given to the membership of the Lodge as a whole in general, but more specifically to the Exalted Rulers who had been in the Chairs during the five years in which it was conceived and completed and to the members of the Board of Directors of the Sacramento Elks Hall Association, who put in long hours of tedious work and who thrashed out many a hard problem in finance and construction during the course of the work. Sacramento Elks Lodge No. 6 began a new chapter in its history in the early 1970s, when it moved into its current home on Riverside Boulevard. Although the Riverside Boulevard building does not have the grandiose exterior aesthetics of the 11th and J streets building, this Pocket area building, which encompasses about an acre of property under root, is nonetheless a high quality building with various amenities. The main feature of the building is its combined rooms, which include the Riverside Room, the Florin Room and the Lodge Room. These rooms can also be opened up for use as one large room. Available for rentals, the combined rooms also include a 50 foot by 50-foot hardwood dance floor and a 46 foot by 16 foot stage. Available to members is a fitness center that includes an indoor pool, Jacuzzi, steam room, racquetball and handball courts and a weight room. Other amenities include a library and meeting room, a lounge with a full bar and small dance floor, a patio and barbecue area, a kitchen and a game room.